Check out the Matrix version i quadcopter from Turbo Ace in the above video. According to Turbo Ace, the 3 axis gimbal will ensure incredibly smooth video that is jello free no matter how you handle the Matrix. The gimbal is Hero4 ready and can even handle lens filters and adapters without effecting performance. In addition, the new high efficiency motors can boost your flight time dramatically. Expect flight times from 30 – 45+ minutes with the Matrix-I, dependent on battery size. As well as, the FPV antennas and receivers can extend your video range up to 2 miles without any latency. The high bandwidth 5.8G transmitters we use give a clear picture with no lag, allowing you to easily fly FPV. And finally, according to Turbo Ace, each Matrix is customized per order. Depending on your needs, we can install on screen display systems, shutter controls, and even autonomous flight capabilities including waypoints and course planning. 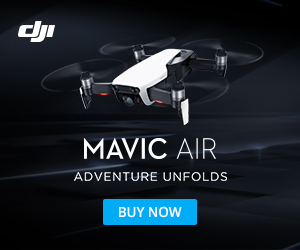 Designed for aerial video and photography, Matrix sports low profile architecture, its triple carbon fiber deck supports a generous 1000mm wingspan that’s foldable down to fit inside an optional carry-on aluminum case for portability. No dismounting and remounting of propellers, landing skids or gimbal are required. Its larger & powerful motors, propellers and batteries offer up to 3 times the flight time and payload of a traditional quadcopter. Ideally positioned camera mount on the nose delivers wide-angle views unobstructed by propeller shadows, reflections and landing skids. And, with versatile battery positions to counter a variety of gimbal and camera payloads, Matrix’s well-balanced center of gravity is key to superior video quality for a wide range of applications.